I learned early in my medical career that the doctor you should worry about isn’t the one who doesn’t know anything. It’s the one who doesn’t know as much as he thinks he does. Not having the answers isn’t fatal if you at least have the self-awareness to know what you don’t know. “Often wrong, never in doubt” is no way to go through life. For all his flaws, Ruben Amaro — let’s bash that piñata one more time while we still can! — has failed as a GM primarily for what he didn’t do. He didn’t acknowledge that his team was getting older and he didn’t correct course while there was still time to take the Phillies in for a safe landing. But his sin was a sin of benign neglect, and it allowed Philadelphia to experience a gentler, more gradual decline than the outright carnage in San Diego. But what A.J. Preller has wrought in San Diego has been as quick as it has been destructive. Like an abandoned stadium earmarked for implosion, a baseball team can be demolished in a fraction of the time it takes to put it together. Preller took over as general manager of the Padres last August, and he quickly set about ensuring that no one would forget his name. He came to San Diego after a decade with the Texas Rangers, where he worked his way up to assistant GM while establishing a reputation as a player development guru who would let nothing deter him from finding the best players possible, not even the rulebook. He was briefly suspended by Major League Baseball for unspecified violations of baseball’s protocols when it comes to signing Latin American prospects. But for a guy who made his name in the slow burn of player development, Preller the GM decided that he no longer needed time as an ally. Patiently building the Padres into a perennial contender wasn’t enough for Preller — he was going all in from day one. This was a refreshing approach for a general manager in the 21st century, given how the prevailing model is to build a team from within by developing a strong farm system, then to tear it down and start over. Wheeling and dealing a mediocre franchise into contention is a relic of the 1970s and 1980s, when guys like Whitey Herzog and “Trader” Jack McKeon would sit down at the winter meetings and swap a dozen players between cigars and an aperitif. Preller’s win-now orientation was particularly refreshing for the Padres, a team that had long been in a condition far worse than merely being bad: They had been boring. From 2004 to 2014, the Padres hugged .500 like a toddler clutching its mother, never winning more than 90 games and losing more than 91 games just once. The Padres took advantage of a comically weak NL West to win the division in 2005 and 2006. The 2005 Padres, at 82-80, are the worst first-place playoff team in major league history. Then, in 2007, they were hapless props in Colorado’s production of Rocktober: The Musical, failing three times to clinch a playoff spot. First, Tony Gwynn Jr. — the son of the greatest Padre of all time — hit a game-tying triple against them with two outs and two strikes in the penultimate game of the season, then they dropped the regular-season finale, and then they lost the wild-card tiebreaker after taking a two-run lead in extra innings. The Padres hadn’t been relevant since. So if nothing else, Preller made the Padres relevant in December. He made everyone sit up and take notice. In a 36-hour span, he traded away 15 players and received 11 in return. 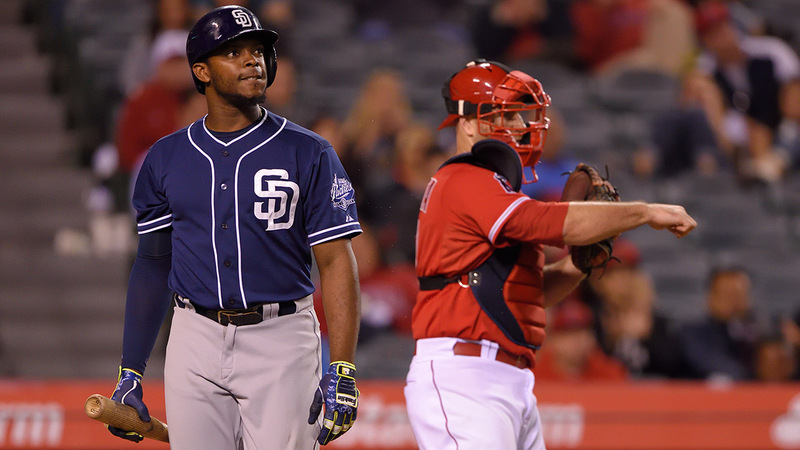 When the dust settled, the Padres had acquired a new outfield consisting of Justin Upton, Wil Myers, and Matt Kemp. Preller had conjured out of prospects and thin air one of the most famous outfields in the game, if not necessarily one of the best. But he wasn’t done. The Padres also had a new starting catcher (Derek Norris) and a new starting third baseman (Will Middlebrooks), and when the market for James Shields unexpectedly dried up, Preller swooped in to upgrade the spot in the rotation that Jesse Hahn had vacated. As spring training opened, the Padres had a lot of new talent on their roster, but it didn’t fit together. They had three new starting outfielders but no starting center fielder; the two outfielders on the roster capable of playing center field (Cameron Maybin and Will Venable) were on the bench. Their infield was largely theoretical. Their lineup leaned heavily to the right side, and their pitching staff was even more right-hand dominant. They still needed another trade or six to turn their collection of talent into a roster that made sense, though with Preller at the helm it seemed like just a matter of time before it happened. 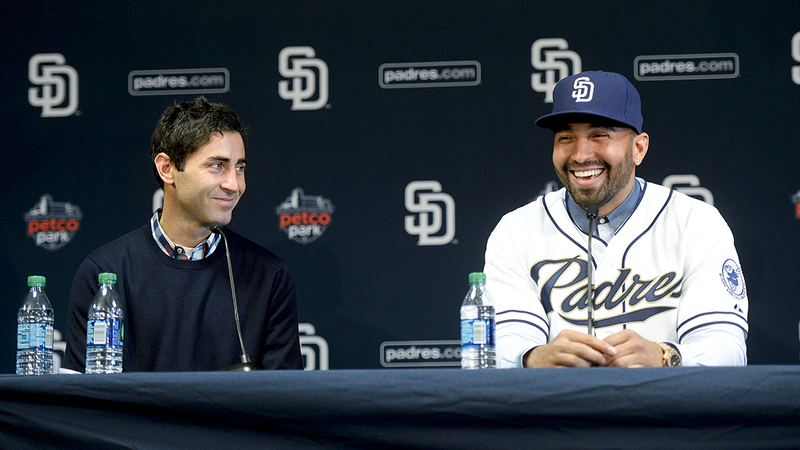 A day before San Diego’s first game of the season, Preller finally made one last big move. But that move didn’t solve the problems of the roster; it exacerbated them. Even then, it looked like the season was destined to go off the rails. April 5: San Diego Padres trade Cameron Maybin, Carlos Quentin, Matt Wisler, Jordan Paroubeck, and 2015 Competitive Balance Round A pick to Atlanta Braves for Craig Kimbrel and Melvin Upton Jr.
Craig Kimbrel had been the best reliever in baseball since he debuted in 2010. In fact, he’d been one of the best relievers baseball had ever seen: In 289 career innings with the Braves, he had a 1.43 ERA and 476 strikeouts. But few teams had less of a need to overpay relievers than the Padres. Under Bud Black and in part thanks to the incredibly forgiving dimensions of Petco Park, San Diego had been able to turn unknown pitchers into quality relievers year after year. It’s not just that the Padres had Huston Street (1.09 ERA) as their closer last year, or that when they traded him they turned to Joaquin Benoit (1.49 ERA). But Street and Benoit had reputations before they got to San Diego. Dale Thayer (2.34 ERA in 65 innings) and Kevin Quackenbush (2.48 ERA in 54 innings) were nobodies. So was Nick Vincent (2.14 ERA in 46 innings) in 2013, and Ernesto Frieri (2.38 ERA in 95 innings) in 2010 and 2011, and Joe Thatcher, who had a 3.18 ERA in 198 innings from 2007 to 2013. Luke Gregerson was a former 28th-round pick who was acquired as a player to be named later when the Padres traded Khalil Greene to St. Louis in 2009; he had a 2.88 ERA in five years with the club. When the Mets dumped Heath Bell on the Padres after the 2006 season, he had a 4.92 ERA in 108 innings for New York; he became one of the game’s best closers in five years with San Diego. Mike Adams, acquired in a nothing trade in 2006, had a 1.66 ERA in 217 innings with the Padres from 2008 to 2011. Even ignoring the talent the Padres gave up to get Kimbrel, just being forced to take on Melvin Upton — signatory to one of the worst contracts (three years and $46.35 million remaining) in the sport — made the acquisition of Kimbrel as costly as it was unnecessary. I didn’t like what I had seen from Preller at that point; I felt he had confused activity with progress. As it turns out, I was wrong. His first, frenetic winter as a major league general manager wasn’t just bad. It was much, much worse. Now, in the midst of the All-Star break, it’s not news to say that the 2015 season has been a disaster in San Diego. The Padres are 41-49 and struggling to stay ahead of the hapless Colorado Rockies in the basement of the NL West. A year after they were outscored by 42 runs over the entire season, they’ve posted a negative run differential of 48 in just 90 games. After a 32-33 start, they fired Black, who was in his ninth season as the team’s manager; they’ve gone 9-16 since. And it’s no secret what’s wrong with them: The Padres’ offense hasn’t improved much, and their run prevention has fallen apart. A year ago, the Padres finished dead last in the NL in runs scored, but allowed the second-fewest runs in the league. While that would suggest that the offense was the problem — and that was certainly the way Preller operated in the offseason — the reality is clouded by their home field, which is one of the game’s premier pitchers’ parks. The Padres allowed 43 fewer runs in home games than any other team in the National League last year. In 81 road games, however, they allowed 341 runs while posting a 4.04 team ERA, both marks just 10th in the NL. The dimensions of their stadium made their pitching staff look better than it really was and their offense look worse. San Diego’s offense is better this season, but not by much. The Padres rank ninth in the NL with 3.91 runs per game, and they’re fortunate to be there, since they rank next to last in the league with a .238 batting average, dead last with a .294 OBP, and 12th with a .368 slugging average. Their newly acquired hitters have all been disappointments to some degree. Justin Upton, after a torrid start (he hit .307/.368/.545 through May), has hit like a pitcher for the past six weeks, batting .176/.281/.244 since June 1. His overall line of .253/.331/.422 is, like his career to date, simultaneously valuable and a little disappointing. Myers was bouncing back from last year’s sophomore slump, hitting .277/.327/.459 in 35 games, before an injured left wrist required surgery that will keep him out until August. Kemp has been durable, but the value of his durability has been extinguished by his .250/.291/.382 batting numbers. Norris is hitting .233/.279/.407. Middlebrooks has hit .215/.242/.367, and recently lost his starting job to Yangervis Solarte. It’s hard to see how Preller thought anything else but this could have happened with the lineup he assembled. Upton is hitting pretty much as you would expect, once you account for his new ballpark. Myers has hit well, as he did in 2013, and he has been plagued with wrist problems, as he was in 2014. Norris’s plate discipline seems to have decided to stay with its patron saint in Oakland (his walk rate is half what it was last season), but his slugging average is right in line with 2013 and 2014. And Middlebrooks? Over a span of 157 games with the Red Sox in 2013 and 2014 — basically a full season — he hit .213/.265/.364. His performance this season is about as surprising as a sunrise. Only Kemp, among the five new regulars in the Padres’ lineup, has performed below the level that the Padres should have expected. Meanwhile, the middle infield — which Preller neglected so he could upgrade an outfield that didn’t need upgrading — has been exposed. Jedd Gyorko, who was rewarded for his 23-homer rookie season in 2013 with a six-year contract — not Preller’s fault! — is working on his second straight disastrous season, hitting .228/.294/.327 while playing uninspired defense at second base. Alexi Amarista has been so bad at shortstop (.207/.276/.290) that the Padres have been forced to turn to 36-year-old Clint Barmes for absolution. It’s not a good offense, and it never projected to be a good offense. It’s certainly not a good enough offense to cover the gaping holes in the defense that Preller created with his bat-first strategy. Upton, Myers, and Kemp are all corner outfielders — and none of them is better than average defensively at this stage of their careers. To start all three of them at the same time, when that meant pushing one of them to center field, was high atop the list of “worst ideas of the 2014-15 offseason.” Maybe you could fake it in a small ballpark, but Petco has one of the most spacious outfields in the game. And sure enough, in just 30 games in center field, Myers — who played more right field than center field in the minor leagues — cost the Padres nine runs defensively, according to Baseball Info Solutions. Before he got hurt, the Padres were trying Myers at first base while starter Yonder Alonso was on the DL. When the guy you had pegged for center field in one of the game’s largest outfields has to be moved to first base … you might not have thought this whole thing through. The Padres have the third-worst defense in baseball, according to FanGraphs, and it has cost the team 28 runs in barely half a season (worse than every team except the Phillies and White Sox). This goes a long way toward explaining why the Padres’ pitching staff, despite having the third-best strikeout rate in the NL, ranks 12th in runs allowed. Just one of their five primary starting pitchers (Tyson Ross) has an ERA under 4.00. The bullpen has been strong as always — eight pitchers have relieved in 10 or more games for the Padres, and all eight have ERAs under 4 — just proving that the Padres didn’t need to trade for Kimbrel. Who, by the way, has the highest ERA (3.24) and lowest strikeout rate (34.8 percent) of his career. Barely three months in, it’s clear that Preller’s gamble has been a bust. Upton will be a free agent after this season, and he figures to get sold off — for a lot less than it cost San Diego to acquire him — by the trading deadline. Venable and Ian Kennedy are also pending free agents and will probably be moved. The Padres are rumored to be listening to offers for Kimbrel, who is under contract for two more years with an option. Even Shields — barely a tenth of the way through a four-year contract — could be traded off if the Padres decide to start over. To acquire Kemp, the Padres dealt three players to the Dodgers, but the main prize was catcher Yasmani Grandal.1 Grandal had been the Reds’ first-round pick in 2010 out of the University of Miami, and he was the prize prospect the Padres acquired when they traded Mat Latos to Cincinnati after the 2011 season. Although he hurt his reputation by getting busted for PED use after his rookie year in 2012, Grandal had quietly been a budding three-true-outcomes star during parts of his past three seasons. In 216 career games before the trade, Grandal hit .245/.350/.412 in one of the game’s best pitchers’ parks. He also became known as a catcher that pitchers didn’t want to throw to. To replace Grandal, Preller traded Jesse Hahn, who had a 3.07 ERA in 14 appearances as a rookie, to Oakland for Norris. Before getting shut down last week with a forearm strain, Hahn had a 3.35 ERA and a 3.44 FIP in 16 starts with Oakland, marks that would rank first and second, respectively, in the Padres’ rotation. He won’t be a free agent until after the 2020 season. For the privilege of acquiring Wil Myers, the Padres surrendered five players, among them Joe Ross (Tyson’s brother) and the “player to be named later” — whose name everyone knew at the time: shortstop Trea Turner, the Padres’ first-round pick last year.2 Ross, the 96th-ranked prospect before the season per Baseball America, pitched his way to the majors after just nine starts in Double-A this year, and in three starts for the Nationals he has walked two batters and struck out 23. He was sent to Triple-A when Stephen Strasburg came off the DL, but he showed enough in his audition to make it clear he’s ready to be a valuable major league starter. The Padres got a good look at what they gave up in Turner, Baseball America’s no. 65 prospect before the season, when he hit .322/.385/.471 for their Double-A team while waiting for the one-year anniversary of his signing to pass so he could formally be given to the Nationals.3 He’s in Triple-A now, still raking. On Baseball America’s midseason list of baseball’s top prospects, published last week, Turner ranks no. 9 and Ross ranks no. 31. For one season of Upton, Preller gave up Jace Peterson and three prospects. After just 58 plate appearances in his debut last season, Peterson has hit .252/.328/.348 as the Braves’ starting second baseman, and has been worth 1.1 bWAR in barely half a season. He won’t be a star, but given the Padres’ middle infield problems, he would have helped them nearly as much as Upton has this season. But Preller also gave up three prospects in the deal, including left-hander Max Fried, the team’s 2012 first-round pick, who was the no. 53 prospect in the land before he blew out his elbow and needed Tommy John surgery last year. While Fried continues his rehab in Atlanta, 20-year-old outfielder Dustin Peterson has hit .261/.330/.371 in A-ball, and 22-year-old outfielder Mallex Smith hit .340/.418/.413 with 23 steals in Double-A before getting promoted recently to Triple-A. That’s an enormous amount of talent to lose for one season of a player who isn’t a superstar. To acquire Brandon Maurer, who has had an excellent season in the Padres’ bullpen, Preller traded Seth Smith to Seattle, where he has hit .268/.338/.477 — better numbers than any of the outfielders that replaced him at such great expense in San Diego. And, finally, there is the Kimbrel trade. Preller so valued the 65 innings a season that Kimbrel throws that he agreed to take on Melvin Upton Jr.’s contract, even though Upton is stretched to be even a fourth outfielder at this point. (He’s hitting .213/.294/.361 in 69 plate appearances this season.) Preller got the Braves to take on a little salary in return, as the Braves agreed to accept Carlos Quentin — who they immediately released despite his $8 million guaranteed salary — and … Cameron Maybin. Maybin was the future of the Padres back when Melvin Upton was still considered a star. After Maybin hit .264/.323/.393 with excellent defense in center field in 2011, the Padres gave him a five-year, $25 million contract — which went sour after Maybin hit .222/.280/.315 in 2013 and 2014 while missing time with injuries and a suspension for using amphetamines. The Braves agreed to take a flier on Maybin, who was owed $7 million this year and $8 million in 2016. And what a flier he has been. Maybin has hit .289/.356/.418 for Atlanta with 15 steals in 19 attempts, and he can actually play center field.4 His contract, far from being an albatross, is an asset for Atlanta, particularly since there’s a club option for 2017, when Maybin will be only 30 years old. But there’s more! (With a Preller trade, there always is.) The Padres also gave up right-hander Matt Wisler, who was actually their best prospect before the season, according to Baseball America’s rankings. After just 12 starts in Triple-A this season, the Braves promoted Wisler to the majors, where in five starts he has a 3.10 ERA. He projects as more of a durable no. 3 starter than an ace, but you don’t have to project much — he’s already there. Oh, and the Padres also tossed in their supplemental first-round draft pick, which was no. 41 overall in last month’s draft. Having already surrendered the no. 13 overall pick to sign Shields, this meant that the Padres didn’t have even one of the first 50 picks. Add up the damage and it’s staggering. In one offseason, the Padres traded away one of the best catchers in baseball (Grandal); an above-average starting pitcher (Hahn); an above-average corner outfielder (Seth Smith); an above-average center fielder (Maybin); and pretty much their entire farm system. Per Baseball America, the Padres traded away their no. 1 (Wisler), no. 2 (Turner), no. 4 (Ross), no. 6 (Fried), no. 9 (Eflin), no. 10 (Jace Peterson), no. 15 (Bauers), no. 16 (Mallex Smith), no. 21 (Dustin Peterson), no. 23 (Burch Smith), and no. 30 (Barbato) prospects, along with the 41st pick in the draft. In return, they got one of the best young outfielders in the sport, who can’t stay healthy, in Wil Myers. They got one year of Justin Upton. They got Matt Kemp and his bloated contract. They got a good young catcher in Derek Norris who isn’t nearly as good as the young catcher they traded. They got two very good relievers in Brandon Maurer and Craig Kimbrel. They inherited the misfortune of playing Will Middlebrooks. The Kimbrel trade already looks like one of the worst trades any team has made in years — and it wasn’t the worst trade the Padres made this winter. That would be the Kemp trade, in which they took on a contract the Dodgers were desperate to unload5 and gave up arguably their most valuable commodity in Grandal. Years from now, the trade for Justin Upton might look as bad as these two. If it doesn’t, the trade for Wil Myers might. It’s as if Preller were unaware of the first rule of Rounders: “If you can’t spot the sucker in your first half-hour at the table, then you are the sucker.” Preller was the sucker. Preller was the guy obsessed with acquiring big names — Upton was the no. 1 pick in the 2005 draft! Kemp finished second in the MVP vote in 2011! Myers was AL Rookie of the Year in 2013! — while his competitors were working the angles. Middlebrooks was a power guy — in 169 games from 2012 to 2013, he hit 32 homers and had 103 RBIs! Craig Kimbrel has led the NL in saves for four straight years! For a player development expert, Preller’s focus on the quick and obvious fix last winter was surprising and even somewhat disturbing. It also was disastrous. The tragedy is that Preller didn’t have to do anything. The Padres’ boring performance on the field the past few years disguised how their future was actually quite exciting. 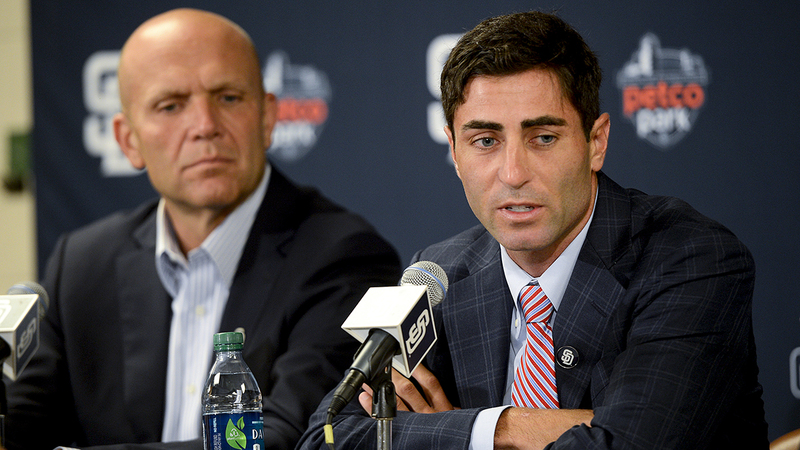 They had two of the sport’s most valuable assets: a strong farm system and payroll space. Even if his offseason splurge had succeeded, the true heroes of the Padres’ winter would have been the player development guys who had put together what had been the sixth-best farm system before the 2013 and 2014 seasons, according to Baseball America, as well as ownership, which authorized Preller to take on so many big contracts. Just for fun, let’s examine how the Padres’ roster would look today if Preller’s first decision as GM last August were to announce he was going to go into cryogenic stasis until Opening Day. They’d have an outfield of Venable (who is hitting .259/.329/.410 and rescued the Padres by taking over center field after Myers’s injury), Maybin, and Seth Smith. They’d have Solarte at third base, and Jace Peterson might have wrested playing time away from Gyorko at second base by now. They’d have Grandal behind the plate. Their rotation wouldn’t have Shields, but it would have Hahn. Joe Ross or Wisler or both would have forced their way into the rotation. Given how bad Amarista has been at shortstop, Turner might well have been promoted to the majors already, particularly if the Padres were in the wild-card race. Which, despite not having as much bullpen depth, they probably would be. They’d have a better lineup and a better rotation. They’d also have a payroll millions of dollars lower, and they’d be on the hook for tens of millions of dollars less in the future. They’d have one of MLB’s best farm systems instead of one of the worst. Less than a year ago, Preller inherited an organization with a promising future, a team with enough talent to finish near .500 last season, and potential franchise talents like Ross and Wisler and Turner in the minors. Today, the Padres are a bad team saddled with bad contracts and no farm system. It’s hard to do this much damage this quickly without the use of heavy artillery. Preller is expected to reverse course any day now; players like Justin Upton could be traded away for prospects by the time the season resumes after the All-Star break. But you can’t rebuild a franchise as fast as you can torch it. Preller isn’t getting nearly as much talent in a sell-off as he gave up in his reckless attempt to remodel his roster. He equated name recognition with talent and paid the price. Perhaps, presumably chastened, he will return to what he was known for in Texas, and try to patiently fashion young talent into a potential contender. The shame of it is that when he was hired in San Diego, he already had both. The Padres also surrendered Zach Eflin, a pitching prospect well regarded enough that the Dodgers immediately flipped him to Philadelphia as partial payment for Jimmy Rollins. Both Ross and Turner wound up with the Washington Nationals in the three-way trade. Thanks to the silliness of this trade — in which Turner had to stay with the Padres for six months even though he was the property of another team — Major League Baseball tightened its rules on player-to-be-named-later transactions. His defensive numbers are pretty bad this year, but they had always been strongly positive before this season, so there’s a good chance that his current swoon is just a sample-size issue. So desperate that Los Angeles agreed to pick up $32 million, leaving San Diego with only $75 million to pay between now and the end of the 2019 season.